Craftsmen Art, Victoria & Albert 1973. Gladstone Museum, and later at the West Surrey College, both 1978. Work included in the Doulton Story, Victoria & Albert, 1979. Group Exhibition "Bowls", Craftsmen Potters Association 1979. Group Exhibition "Natural Form", Rufford Gallery, Rufford Park Ollerton (Notts), May 1981. 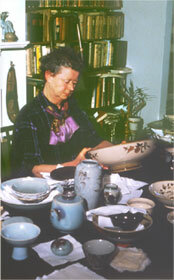 Royal Doulton Collectors Club, Lecture on saltglazed stoneware, Nov. 1981. Group Exhibition, West London Craftsmen, Bentalls Kingston, and lecture on porcelain, March 1982. Gunnersbury Park Museum, slide lecture on slip painting, Oct. 1982. Work in numerous museums and galleries. including the Victoria & Albert Museum, London, York City Gallery, Hanley Museum and Doulton's Museum both in Stoke on Trent. Hammersmith College of Art (now Chelsea School of Art) 1961-80. Richmond Adult College 1962 on. West Surrey College Art & Design 1961 on.